window sun protector blinds are not a very important issue for the hot sun in the summertime only. Some products are also a great option for creative, functional and stylish designs, for example, the 3D blinds made of wood, that is integrated optimally into every interior and sets beautiful accents. 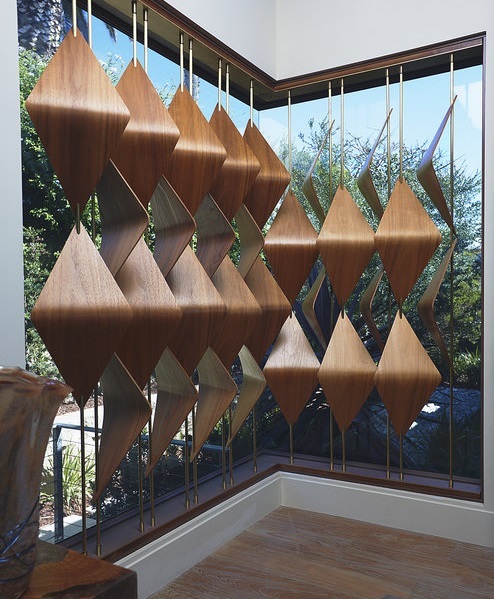 The 3D wooden blinds, that we would like to present to you, are an attractive and contemporary alternative to the wooden blinds and wooden room dividers. 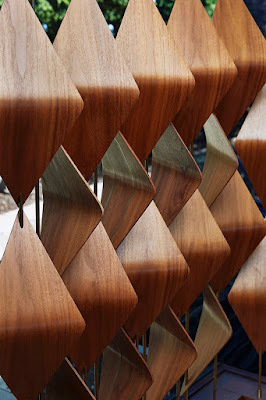 They are designed by the talented American designer Elish Warlop. With her creations, she tries to interpret the paradox between silence and movement. 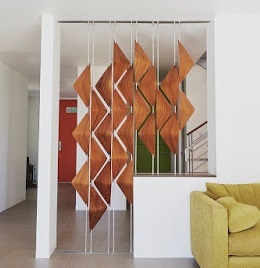 The 3D diamond elements in blinds design are attached to vertical steel cables. Each bar can also be turned so that daylight can be directed in the desired direction. The designer was inspired by the concept of parquetry, where different tiles have edge points in common and can create a flat plane together. 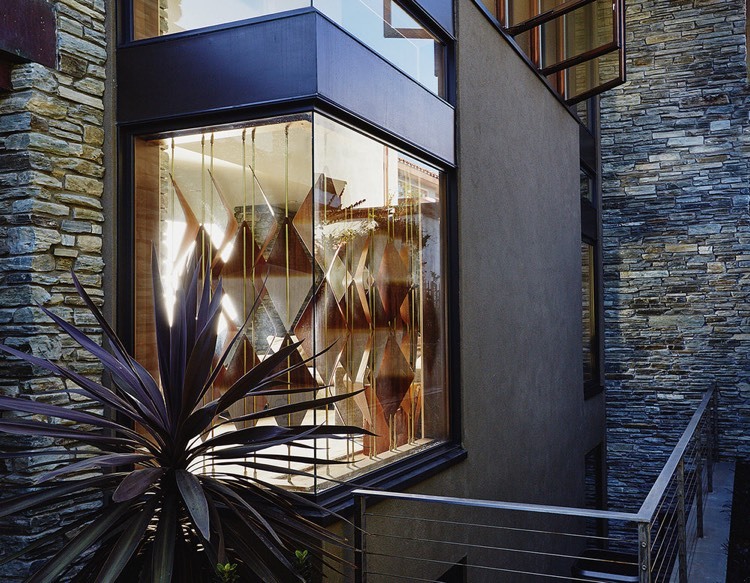 Thus, the construction can also serve as an opaque screen in the evening. 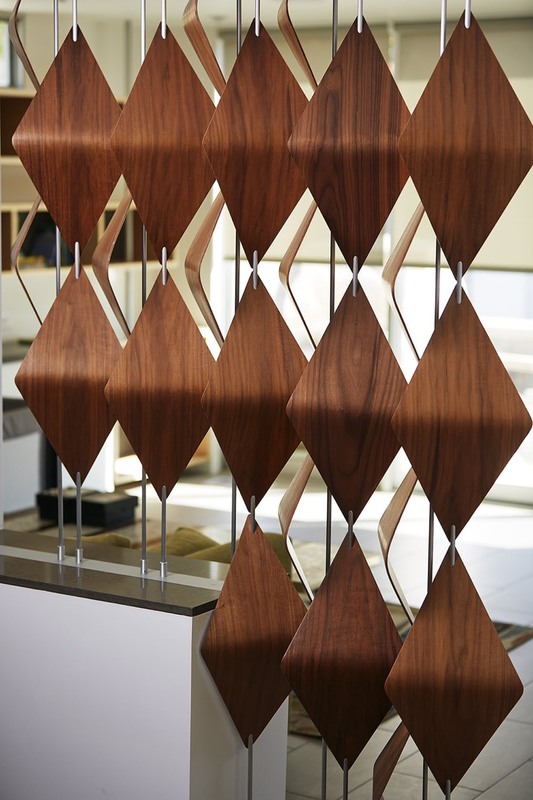 They are ideal for shielding large glass fronts as shown in the example. 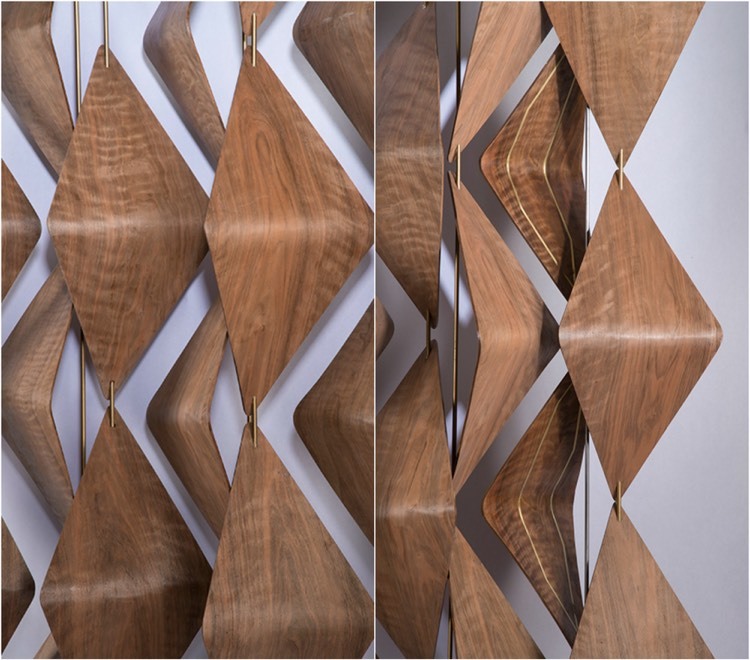 The 3D wooden room divider looks very stylish and not only because of their shape but it also consists of high-quality walnut wood, which is characterized by a pleasant dark wood tone. The coloration varies from dark brown to black-brown tones. 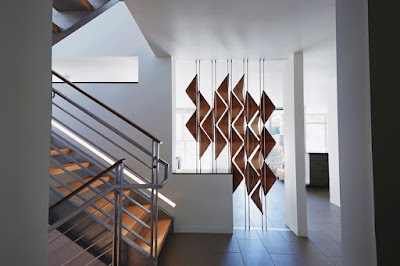 The visual antipode to the solid wood material is filigree but hard steel ropes. 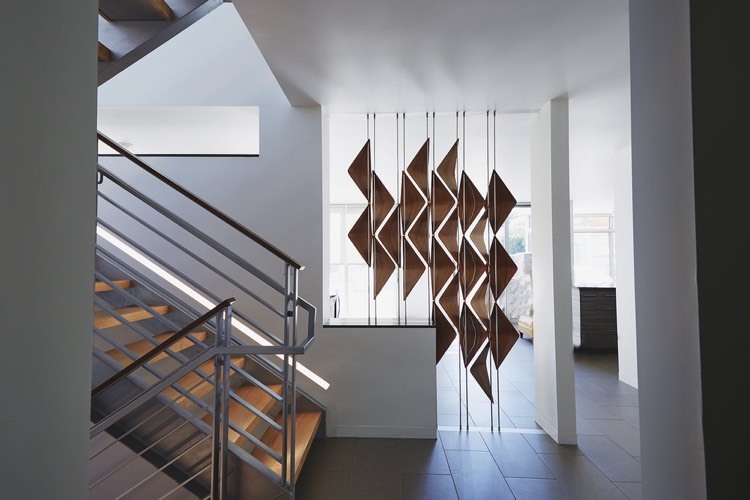 The composition of wood and steel gives each room a dynamic yet warming radiance. The wood-steel construction is ideally suited not only for visibility and sun protection but also as a room divider. 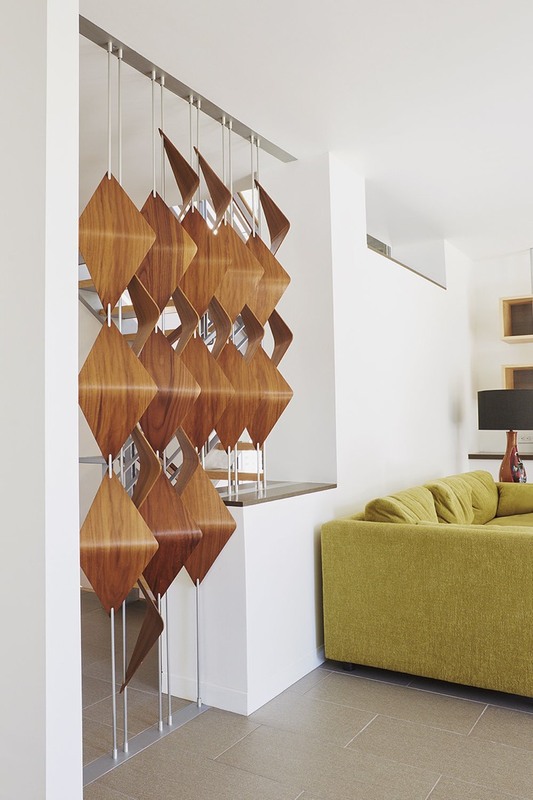 Depending on the angle of rotation, the wooden 3D room divider can separate or joint spaces. The design fits in a country house as well as in a modern apartment. Combined with a yellow-green sofa and floor tiles in Taupe, a particularly harmonious ambiance is created.